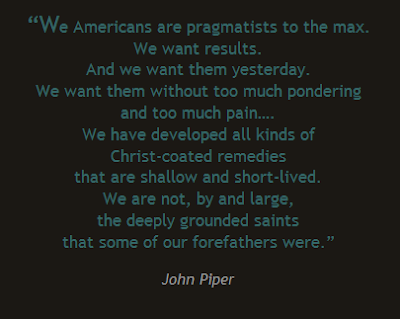 As I pondered this quote by John Piper, I looked up the word "pragmatist" in the dictionary. It says "a person who is oriented toward the success or failure of a particular line of action, thought, etc. ; a practical person". In our society, people often look at the bottom line. What were the results of the action? Was it a success or a failure? And how quickly was it achieved? We turn to self-help books so we can follow a set of rules. Isn't that what the people in the Old Testament tried to follow? And how well did that work for them? Spiritual growth and lessons take time. And often the results aren't seen immediately. Think about the missionary Jim Elliot who died at a young age attempting to share the love of Jesus with the Auca Indians. He and three others were killed by them. Their bodies were pierced with spears and hacked by machetes! Was Jim Elliot a failure? If the world read about this killing in the newspaper today, many would think his attempts ...were a failure. But as his wife continued on in this ministry, the Auca's came to know Jesus over time. Elizabeth Elliot and the other wives of the slain men didn't leave. Instead, the people who killed their husbands were curious and many came to know the Jesus that these missionaries knew. I'd say that ...Jim Elliot's life was a success. So, let's not use the world's success or failure standard. Whatever you do, work at it as to the Lord. We may not see the results of our work but we can trust that they will not be wasted. Some plant the seeds and others may water them. Do your part and ...trust the Lord with the results. Such a wonderful post sis. Father God certainly has a whole different measuring stick when it comes to success. A few years ago I read Shadow of the Almighty by Elisabeth Elliot and it changed me. Can you believe my book club wasn't interested????? Great post, Debbie. Great point Debbie. And Mary was right in her comment that God has a different measuring stick. So true! "instant". But God of course KNOWS the ending before He's ever begun. This was very thought provoking....Have an awesome day. "Trust the Lord with the results" I like that. We definitely have to do that as we ground ourselves into Him instead of the world. Thanks for the post today it was great! Excellent post. We get too easily fixated on the end product instead of realizing that God is concerned with walking with us along the journey and transforming us all along the way. It's nice when things work out "right" in the end like we plan, but God doesn't judge success like we do. You're so right about Jim Elliott - and definitely his life was successful. What a wonderful reminder that how we see a person's life and how God sees a person's life are from two entirely different perspectives. Thanks for sharing. Debbie, I have thought of this at times...we think of the quick fix, the temporal remedies, but we do forget the process that God wants us to experience...that is why He allows us some challenges, and even heartache...but we grab the charge card and "fix it", covering the wound rather than putting the healing salve of Jesus on it. We have, as Christians, fallen into the World's way of solving problems. I like your comment about trying to follow a set of rules, as the Israelites did...they did not realize that the rules were to lead them to recognize their sin...we are the same..."don't show me the sin, just get me out of this mess!" We miss the grace of God in that process...we miss the Lord's leading and we miss HIM! We shoot right over the top, and try to bypass the message, leaving us only to make the same mistakes again. Such a good post, Debbie...I'll remember it. God bless you...you are so special! I found you through Kelly's blog. She is so amazing. While I have never lost a child. I do know the loss of a mother, and I see that you too have lost your mom. It will be 5 years in February. After Mama passed away, one of my sisters left and has not been back since. She is coming tonight and I am so exited. As I told Kelly, there are days when I dance and days when I just want my mom back. I know she is well and I know I will see her again, but sometimes, I just want her here! Missing her and praying for your loss and recovery! Funny Debbie, Anna May and I were talking about this very thing on the way home from BSF today. I was telling her how I wouldn't mind exercising if I saw immediate results - well, anything can apply for that matter. Prayer, dieting, discipline of any type. I just want to see those immediate results. So use to a fast-food mentality. I even gripe at my kids about it, take a "preachy" attitude toward others who seem to be struggling with "sticking to it." Hm.....could there be a log in my own eye? Keep up the good work Debbie. Perhaps you'll never know how your faithfulness may help others (like me) to eventually become successful in some of those "good habit" areas. Very good post. I like to say that God has not called us to be successful, but faithful. What an excellent example – Jim Elliot – of a Christian who was deeply grounded and as far away from pragmatic theology as one could find! I believe eternity will bear out the truth of what is solid grounded biblical thinking & living and what is pragmatic nonsense. You are absolutely correct when you write that the world is not our success standard! Scripture doesn’t even come close to representing that! Good food for thought here and another excellent take on Piper’s quote! THANKS! Thank you so much for sharing this week with IOW . . . and the mention of Jim Eliot & his wife . . . so fit in! Thank you for sharing!